Blue Diamond Machinery’s new ‘Xtreme’ range of generators are tough mobile power providers that are compact, have less maintenance issues and are more efficient than alternatives on the market. They also offer impressive fuel economy, and while this may equate to a more significant expense initially, Xtreme generators will offer significant savings on fuel use and maintenance. They also offer a higher resale value, meaning some of the initial expenditure can be returned when you upgrade. Xtreme generators are robust, so no amount of rattling in the back of a ute will affect their performance, whereas lower quality generator products will struggle to cope with truck vibration during travel. Designed by AIRMAN Japan, the generators are designed for all weather conditions and can be used for instant power on a construction site or on your farm. Almost all industries are now dependent on advanced technologies that need power to run. The Xtreme range of generators comprise premium components and have been designed specifically for use in the construction, farming and mining industries, while also suiting the generator rental market. Adding to this, the machines have been designed to meet Japan’s very tight emission controls, making them ultra-quiet and more environmentally-friendly than a standard generator. The most popular Xtreme generator models are the 13KVAs, 25KVAs and 45 KVAs as they are the most suitable for a number of situations – both for prime power use as well as for short periods of usage. Most generators are fairly sizable and are only able to cope with being used for short periods, whereas the Xtreme range is much more compact and has been designed to run continuously without any problems. Blue Diamond Machinery also offers mobile engineers and has an in-house workshop. Its generators also come with a one year warranty. 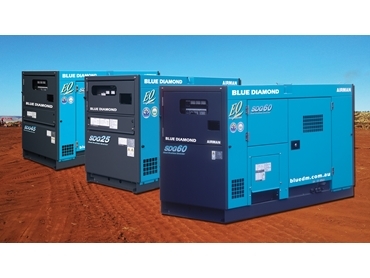 Blue Diamond Machinery is an exclusive agent for the Xtreme Series generators from AIRMAN Japan, so for more information, contact us on 1300 998 647 or visit our website http://www.bluedm.com.au.